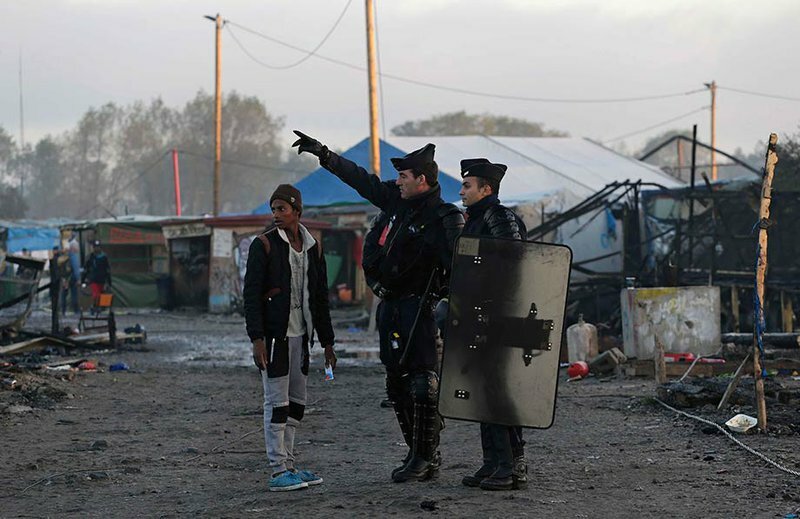 French police officers direct a migrant in the remains of the Jungle Camp near Calais, on 27 October 2016. Emilio Morenatti/Press Association. All rights reserved. Late last month, on Monday, 24 October 2016, the French authorities began the demolition of the Calais refugee camp and the eviction of its residents. Whilst this settlement was makeshift and temporary in various respects, it was a place of life and social stability for more than 10,000 people, a thriving town with shops, restaurants, schools, and religious and community centres. It was also a place of uncertainty and precarity, characterised by increasingly coercive police interventions. Local organisations estimated that approximately 2,000 residents left the camp ahead of demolitions to seek shelter elsewhere in northern France. 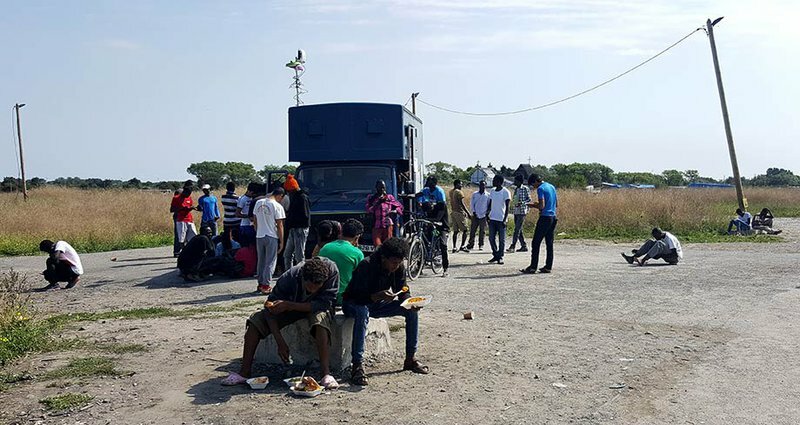 The police attempted to catch them in the lead-up to the evictions, patrolling the Calais city centre and searching through parks and bushes, and it was reported that at least 150 people were arrested at the Calais railway station. They also targeted volunteer camping sites and local hotels with the aim of finding any camp residents ‘in hiding’. For many of the former residents of the Calais camp, its demolition is, more than anything else, another episode of their continued displacement, driving them another step closer to exhaustion. Diggers began to demolish living spaces and communal spaces on Tuesday, however the fires that broke out soon thereafter did much of the work for them. On the third day the authorities announced ‘mission accomplished’ as most of the camp had gone up in flames and large numbers of people had been shipped away on buses. The fires were blamed on camp residents, however refugees and charities alike reported that young refugees were paid by unknown external parties to start the blaze. Some claimed that the demolition could never have been completed without such measures. In any event, many people – including many children – were at this stage sleeping in the streets and under bridges. Whilst the demolition of the camp has received substantial media interest, with ‘spectacular’ images depicting fires and explosions, much of this reporting has focused on the plight of children, and especially unaccompanied minors. These children are extremely vulnerable and it is indeed outrageous that they have not received the protection and care they need. However, the sole focus on unaccompanied minors has drawn away attention from the vast majority of people who lived in the camp. What is the situation of the nearly 10,000 other people who have been displaced once again by the recent demolition? The ‘politics of exhaustion’, as we explained in a previous article for openDemocracy, refers both to the ways in which exhaustion is employed as a tool of governance and control, and to the ways in which it is experienced as a daily reality by refugees. When we spoke to the women and men of Calais’ camp, many residents referred to “being so tired” and of having been “completely exhausted” by repeated evictions, detention, push-backs, deportations, untreated health problems, below-standard living conditions, the continuous threat and reality of violence, as well as by continued uncertainty both of daily life and of their future prospects in Europe. The notion of a ‘politics of exhaustion’ expresses the idea that these experiences are closely linked to the migration management policies adopted by the EU and national and local governments, such as the increasing violence in informal settlements. Highlighting this furthermore suggests that, rather than a ‘solution’ to the ‘problem’, the demolition of the camp merely continues a strategy that has shaped the lives of residents for months, if not years. We will discuss three ways in which the politics of exhaustion has been experienced in the context of the demolition of the camp: firstly, the continuity of displacement and dispersal; secondly, the inadequacy of information and communication; and, thirdly, the recurring and/or continued experience of violence and trauma. French police during a raid of the Jungle camp in July. Photo by author. All rights reserved. The French authorities’ ‘mission accomplished’ declaration on the third day was premature and misleading in various respects. Many people had not left the camp, despite the demolition of their shelters. In addition, most of the unaccompanied children remained in the container camp, whilst a significant number were unable to register and hence left outside on the street. Yet, even when all residents had been removed and fires and bulldozers had physically destroyed all the camp’s structures, this was not the end of the story. Many of the camp residents were transported to reception centres across France, where they would be given shelter and could start the asylum process in France. However, this does not mean that all those who agreed to go with the authorities will have their asylum claims assessed. Despite promises that fingerprints would be erased, those whose fingerprints were taken elsewhere prior to arrival in France could be deported to their first country of arrival in the EU under the Dublin Regulations – usually Italy or Greece. The prospect of asylum in France might thus be a false one, resulting instead in yet further displacement. Despite promises that fingerprints would be erased, those whose fingerprints were taken elsewhere prior to arrival in France could be deported to their first country of arrival in the EU. Many individuals we spoke to during our (separate) research studies had crossed the European continent more than once, with deportations and detention periods interrupting the journey and delaying their recourse to asylum and legal aid in their target country. Many individuals spoke of repeated deportations to eastern or southern Europe where their fingerprints had been taken upon entry into the EU, but where violence and unsustainable living conditions compelled them to try again. It is this recurrence of being pushed-back, dispersed, and circulated around that is experienced as exhausting. Those who are returned to their first country of arrival in the EU under the Dublin Regulations might subsequently be deported to their country of origin, although they equally might be allowed to continue their uncertain existence in Europe. From there they might continue trying to reach the UK, or they might try a different European country this time around. Thus, the trajectories of many migrants are not direct movement from insecurity to safety, but rather are characterised by recurring or continued displacement, and it is the perpetuation of this circulation and uncertainty that constitutes the politics of exhaustion. For many of the former residents of the Calais camp, its demolition is, more than anything else, another episode of their continued displacement, driving them another step closer to exhaustion. This is also the case for people who decided not to board the buses to the reception centres, instead seeking shelter in other informal camps in northern France. In addition to the well-known Dunkirk camp in Grande Synthe, smaller camps dotted around the region have swelled following the Calais camp evictions. One former Calais camp resident reported that some of the smaller camps have more than doubled in size, from around 200 people to more than 400 or 500. Based on previous field research conducted by the Refugee Rights Data Project, this is alarming given these camps’ limited infrastructure and aid provision, as well as their squalid living conditions. These camps lack the facilities and resources of the Calais camp, and new arrivals are now in much more precarious circumstances than they once were, just as winter approaches. On top of infrastructure and provision problems, the decreased visibility of these smaller camps means that the problems are more likely to go unnoticed. Some camps receive support from local charities or individuals, whilst others are almost entirely managed by smugglers. Following the evictions, many others appear to have set up tents in forests in the region, with no infrastructure or recourse to aid, suggesting that new small settlements might grow. Along these lines, a Sudanese Calais resident we spoke to following the evictions reported that many refugees have now returned from the accommodation centres and set up camps on an ad hoc basis, possibly because they felt trapped in the centres, with police patrolling outside their accommodation. He explained that “at least they were getting support in Calais, now it’s even worse”. Another aspect that plays into the complexities of daily life and continued displacement concerns the smuggling industry, which has likely benefited from the eviction of the camp. One former camp resident told us that “[the authorities] made a real chance for smugglers to make more money. People are desperate to move to the UK for their own different reasons so more people turn to [smugglers]. It can be very helpful for these people”. The person also noted that the price rate for being transported to the UK nearly doubled following the announcement of the eviction. The grassroots charity Refugee Info Bus similarly reported that many refugees became more risky in their attempts to reach the UK in the lead up to the eviction, with children taking increasingly dangerous and life-threatening routes. This part of the story, in which people feel pushed by increasingly coercive migration management strategies to undertake ever more dangerous attempts becomes obfuscated by images of burning camps and slogans like “mission accomplished”. A second aspect of the politics of exhaustion in the context of the demolition of the Calais camp concerns the scarcity of information and communication on behalf of the French authorities. During the past year, the authorities’ main channels of communication have been coercion and violence. Little information was provided regarding issues such as the upcoming demolition and what provisions would be in place for the residents of the camp after demolition. More generally, the authorities have been reluctant to offer information regarding the French asylum process throughout the existence of the Calais camp. This information was mostly provided by aid organisations and volunteers, including the Refugee Info Bus and the Calais Legal Centre. The latter burned down a few months ago, yet continued to operate on an ad hoc basis out of a vehicle. Residents of the former Jungle camp eat outside of the Refugee Info Bus. Phot by author. All rights reserved. Communications between the French authorities, the aid organisations and camp residents were poor as well. One local charity reported that there was no formal eviction notice, only “whispers in the ears of larger NGOs”. At some stage refugee community leaders were informed too, and promised that “all [Dublin regulation] fingerprints would be erased if people complied and got onto the buses” according to a local NGO source. However, these promises were never made in writing and could therefore not be followed up. Rumours of three vacant detention centres being put in place in the region further added to the concerns of camp residents that the buses could be a ‘trap’ leading to detention and deportation rather than safety. One camp resident said that, “some would follow the authorities because they wanted a safe, warm place, but others didn’t because there was no trust between authorities and refugees [...] Many had big doubts about how the authorities were going to deal with them because they had been fighting with tear gas and maybe they think it’s better to die by the cold than the authorities and the fascist groups”. Communications in the camp generally relied on mouth-to-mouth circulation of news, unofficial information and indeed rumours, despite substantial efforts by grassroots groups and individuals. For instance, the Refugee Info Bus ran legal workshops and distributed 4,000 information packs in all main languages spoken in the camp. The uncertainty of people’s lives that adds to the experience of exhaustion is therefore not only a matter of the continuation of physical displacement and circulation. It also concerns the circulation of knowledge, in this case the absence of clear and accurate information and communication regarding their living spaces, legal status and means of survival. Thirdly, the politics of exhaustion plays out in the form of the recurrence and continuation of experiences of violence and trauma. The population of the camp was diverse insofar as it comprised people from a range of countries, backgrounds, and migration trajectories. Yet, they have all experienced violence either in their country of origin and/or en route to and across Europe, whether in the form of physical, psychological, sexual or structural violence. Rather than having found a place of safety and stability in Europe, living in the Calais camp often meant being confronted with more violence. 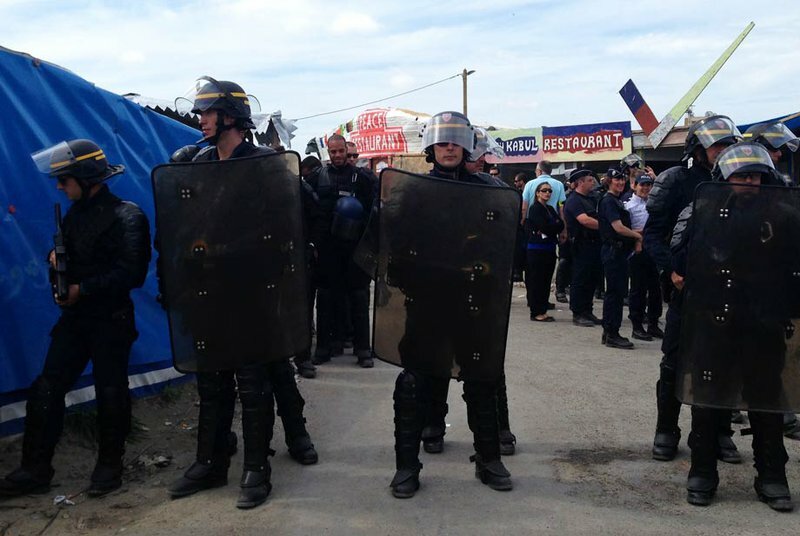 As mentioned, the demolition of the camp was not a unique event in the sense that it can be seen as a continuation of coercive practices that mark the Calais border zone. The experience of demolition is therefore not only a matter of material destruction but also one of encountering arbitrary violence in Europe, which was supposed and/or expected to be a place away from these kinds of experiences. Having said that, many residents experienced the demolition of the entire camp – whereby they saw their shelters, community and religious centres, shops and restaurants go up in flames – as a traumatic event. Seeing the home one has built by hand – even if it is a makeshift and temporary one – being destroyed arbitrarily can be a harrowing experience and might revive the experience of fleeing one’s home in order to find safety in Europe. Persecuted communities from the Horn of Africa saw their church leader arrested and the church itself demolished; a place that had provided solace and security for many. Attempts to stop the destruction of the church by congregating and singing delayed the demolition but could not halt it. The experience of demolition is therefore not only a matter of material destruction but also one of encountering arbitrary violence in Europe, which was supposed and/or expected to be a place away from these kinds of experiences. One former resident told us: “[Calais] was a symbol of hope for people. I am feeling sadness, inequality and injustice. At least in Calais Jungle we were feeling friendship and we had our communities and we felt free”. The recurrence and continuation of experiences of violence in a range of forms thus adds to the instability and uncertainty created by continued physical displacement and circulation and the ways in which knowledge is (poorly) produced and circulated. Whilst this politics of exhaustion helps to produce vulnerability, this cannot be understood without considering people’s continued struggles for mobility. There is no ‘mission accomplished’ here. As long as informal camps have existed in the Calais area, and across Europe and elsewhere, we have seen people’s agency; their determination to move despite increasingly intrusive and coercive policies and practices of migration management. Our research suggests that those continuously displaced also continue their efforts to find a place of safety, community and/or better opportunities.